There’s a little bit of magic in the cast BUT apart from that the moonlight just revealed all the flaws with this dated affair, old sport. Despite the age gap, Colin Firth and Emma Stone have good chemistry and make this easy going and predictable 20s flick more than watchable. So what is it about? An illusionist (Firth) is brought in to help unmask a possible swindle with a young “spiritualist” (Stone). To make matters worse, he might be falling for her. I will admit that I’m not the biggest Woody Allen fan. I really feel that his work is overrated. That’s not to say I haven’t enjoyed some of his films. I actually didn’t mind Match Point and Vicky Christina Barcelona. But did Woody Allen use my love for ScarJo against me? Colin Firth was superb as the deluded egotist and illusionist Stanley. His quick quips and sarcastic commentary certainly made him a monster cut from the same cloth as Blue Jasmine (Another Allen flick I enjoyed). Allen and cinematographer Darius Khondji capture the look and feel of the 20s perfectly. 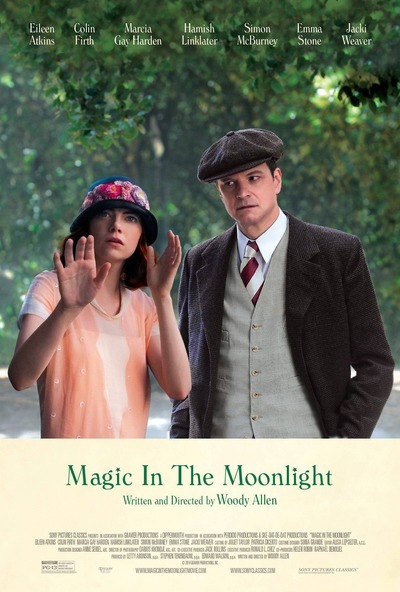 Magic In the Moonlight is rich with that nostalgia for the classics. It’s good to see Simon McBurney getting more screen time. I’ve been a fan of him for some time. His performance as the Arch Deacon in Rev being a particular highlight. He sweeps into the scene with his sly grin and slithery charm in the form of an old university colleague, Howard Burkan. Setting Stanley on his journey with a wager. A wager to try and expose Sophie the spiritualist as a fraud. It’s all rather tame, easy going and delivers the odd chuckle as Stanley goes out of his way to upset the fools that celebrate this so-called spiritualist. Hamish Linklater played the love struck and incredibly gullible Brice Catledge brilliantly. Marcia Gay Harden (The Mist/Flubber) was a little flat. She has proven in the past that she can play a strong supporting role and play it well but her mother figure was highly unmemorable. Eileen Atkins (Doc Martin) was very good as Stanley’s Aunt Vanessa. Providing a little more depth and understanding to her heavily armoured nephew. BUT it’s all so predictable which makes it all a little drab. The beautiful sunshine and the picturesque French coastline is still a sight to behold. Instantly making me want to go on holiday and distracting me from scribbling on my critical clipboard. Firth delivers enough charisma to carry the film. Until he meets Sophie. The spiritual sessions are entertaining enough as you sit there with Stanley trying to work out if it is a con or real. The effects aren’t that bad either but this is essentially a theatrical piece. The whole philosophical debates about the afterlife was interesting enough for twenty minutes and made for some fiery exchanges between the two leads. BUT after a while, that’s all they do. Talk and bicker about life, death, love and beliefs. I can see what Allen was trying to do but it just got a little irritating, long winded and a bit pretentious for me. At first glance, I thought that only a friendship was going to blossom between the pair because of the steep age gap. I don’t think it helped that Stone’s outfits made her look a little too young. I’m not sure whether that was Allen’s intention. The change in tone as their relationship transforms to possibly something more came off a little uneven. Stone and Firth did enough to make it believable. But if I’m honest, it wasn’t necessary and it made the final outcome so predictable and cheesy. Stone is in very high demand and for the majority of her performance, I could see why. There were moments where her little spiritual tricks went on a bit and she did begin to get on my nerves. She can’t dance. Well, jive anyway. Her improvised moves in a jazz club had me cringing. The ending was very much like the classics. And that was the problem. The dated and corny moments we laugh at now with the oldies only added to their charm. However, when you try and rekindle that in a modern reworking, it just doesn’t come off quite as well as you hope. The final moments were very hammy. That charm coming off a little tacky. I tutted and shook my head. A guilty smile sneaking across my face for the attempt. An easy going, charming little time filler with two stellar performances. Just don’t expect too much.